Welcome to the ar blue clean ar390ss total power pressure washer review. In the water damage and restoration industry, the electric pressure washer is a must have power tool on the truck. This residential use portable electric appliance allows you to take the washer indoors without the worry of toxic carbon emissions of a gas powered unit, such as a Honda Black Max. With the proper accessories, you can get a lot of tasks completed in less time and have the power to do it makes it even better. That’s where our reviews will help you decide on the perfect electric power washer. Q & A AR383SS vs. AR390SS What’s The Difference? 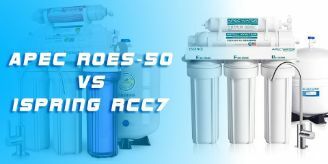 The ar383ss has a 28-ounce detergent tank while the ar390ss has a 48-ounce detergent tank. What Hose Comes With The AR390SS? 1 What Hose Comes With The AR390SS? Out of the box, you get a black rubber hose and not the stainless Steele braided hose. While the braided hose won’t kink or break the rubber hose that comes with the machine is probably all that anyone would need for several seasons. Have you ever tried to roll up a pressure washer hose before? Do You Have To Unwind All The Hose To Use This Power Washer? Yes. I have found cleaning inside or outside it is best to un-reel all the hose before starting any work. This will help you by being able to clean all areas within a 30′ of the power washer. Is The Reel a Functional Reel That You Can Use a Standard Hose Reel? The reel is functional as far as winding the hose up and used as a handy storage. By not unwinding the hose you could turn the machine over when you pull it. This could cause some issues. I suggest that you unwind all 30′ of hose. As a water damage contractor, and user of the ar390ss and the ar383ss I haven’t found many problems with this top rated pressure washer and one of the best power washers under $400. Below is a list of Pros and Cons for you to consider. Comes equipped with 4 Pro nozzles Red (0 degrees,) Black (soap,) Green great for driveways (25 degrees,) and the rotary turbo nozzle. The ar390ss has a built-in soap adjustment. You can set the detergent level by turning the adjustment knob from minimum to maximum disbursement. Easy to power on and off with the power knob on the front of the body. You won’t have a hard time looking around to find the switch because it is in plain sight. This appliance is relatively quiet due to the fact that it is an electric power tool. Like all power tools in certain environments, such as using inside of a basement, home, or garage, you may need to wear ear muffs, when washing. 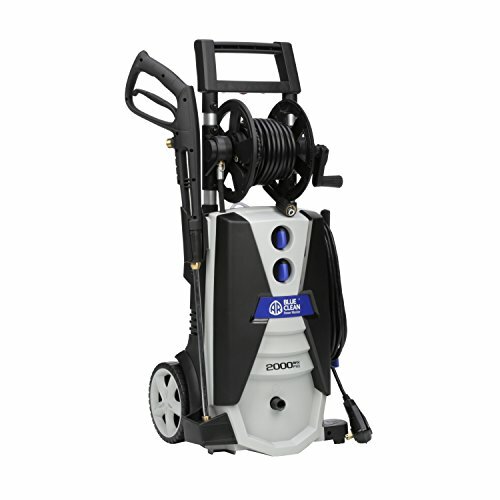 The AR Blue Cleanar390ss is small and very portable pressure washer. It weighs less than 40lbs and has oversized durable plastic wheels that will roll easily over any surface. The ar 390ss has 2000psi which makes this rugged sleek machine one of the more powerful units blue clean, manufactures. The rotary nozzle is not a quick connect. You will need to turn off the water and power to the unit and remove the lance in order to install. Basic cleaning nozzles. Stated earlier, this unit comes with 4 nozzles, most will not use the red 0-degree nozzle because it could blast holes in concrete or remove mortar from the brick siding. The green 25-degree nozzle, while gives a good cleaning on most surfaces may be a little too much on other surfaces where a 40-degree nozzle would be preferred. The manual trigger lock on the gun can be a nuisance at times when you need to start or stop spraying. Although, you can use the gun without activating the trigger lock. I have noticed that consumer reports complaints that the company is located in North America, Minnesota to be exact, they do offer a toll-free phone number and email to customer support and warranty issues. That’s about all the cons that I can think of after using the ar390ss pressure washer. I have read a few reviewers that stated the instruction manual was difficult to understand. I found it to be straightforward. You can just call the helpline toll for free…. While we are on the subject, if you live in a zone that is prone to freezing it is a good idea to read page 17 all about the pump saver plus manual before storing the unit away for the season. Your ar390ss, a gun has a 15mm fittings and standard pressure washer fittings are 14mm. This, all by itself makes using standard PW gun unthinkable. If you have the need to use a professional wand such as the Mosmatic, MTM-guns and foam cannons, then I have a special tip I learned that will allow using any standard gun. This hack should work for any of the ar Blue Clean, or Sun Joe washers such as the Sun Joe spx4001pressure washer. What you need is the parts by Twinkle Star Pressure Washer Adapter Set Quick Connect Kit, TWIS291, which connects an M22 to 14mm. Then you can use any standard gun or wand. The ar390ss is a cold water electric pressure washer. All you have to do is connect it to your outside water faucet or indoor faucet and turn the machine on in order to start your work. Warm or hot water pressure washers are generally industrial machines used for cleaning grease from restaurant hoods. For more troubleshooting tips read the manual. Now you know more about this fantastic pressure washer why not try it for yourself or give it as a gift click here for the best place to buy and get your hands on the ar blueclean ar390ss today.